Change is inevitable,it will happen to you, some are desired some undesired, some are sweet some sour,some are joy some sorrow, but delight one is about to experience is only in case of former, why not make the former occur now, to you! So embark on a journey that takes you to the great Himalayas,where the men of wisdom were enlightened, the roopkund trek was my very first interaction with the vast mountains,valleys,fresh untouched green grasses, tall trees in dense evergreen forests and everything that will give you happiness, that will freshen up every bit of you, that will rejuvenate you within you. to make it up? Nothing serves the purpose and better you keep climbing, that’s the mantra. This trek will need 100% effort from you, although this trek is under the category of moderate to difficult, it would be quite difficult for the first timers, hence start running about 3 km everyday 10 days before the trek to build stamina for your upcoming trek. the jungles with dense oak trees,there is lot of flora and fauna to be seen around, you must have good quantity of water throughout this trek,since drinking water may not be available for hours. of birds around, stop take a bit of rest and capture the beauty within your mind and camera as well, as you keep climbing suddenly there comes a point where all the great tall trees fall back abruptly and there is grass all over , like a green carpet laid everywhere you see, from this point the trek is a bit sympathetic for the climbers, this will take you to another 1500 feets of altitude, after all day of painful climbing when you see the camping site ,am sure it will make you forget everything, such is the magic of Bedni. The green carpet of grasses, cold breeze, beautiful sight of clear snow laden mountains far behind the dry grey mountains touching the skies. I was admiring the nature whole evening ,until the sun went down to sleep. On a personal note I experienced breathlessness and feeling to vomit after entering our tent, although the sleeping bags were comfortable it wasn’t really a comfortable night for me. Morning sunshine on the dew wrapped grasses make them look astonishingly beautiful to look at, whole of the great green carpet shines, the horses moving around with bells around their necks create a wonderful sound. vinayak to Bhagwabhasa, you will start feeling the breathlessnes due to decrease in the oxygen content that occurs at such height it will take approximately 1 and half hours of trek to reach Kalua vinayak from Pathar Nachauni, you may feel dizzy as well, since we were at an altitude of about 14500 feets at this time, this is a very steep climb and goes all the way zig zag. From Kalua Vinayak which is named after the black stoned statue of lord Ganesh, we headed to Bhagwabhasa which gets its name from the stone huts that locals have made up, from this point things change up and all the lush greenery you saw all the way is lost somewhere, and there are only rocks to be seen everyone ,bare rocks some lying loose and some in form of large gigantic mountains, by evening 5’o clock we were there on our camp site. The temperature here can go extremely cold , and went down to -4 deg C in the night, hence the only option is to have a good sleeping bag and tightly enclosed tent, all most everyone will be feeling dizzy and breathless at some point of time at such an altitude, better I took altitude sickness tablet. The views and sights at Bhagwabhasa are also extremely beautiful, some mountains seem to have a deep blue mixed grey colour,some bear the colour brown. All the snow laden mighty mountains become clearly visible, some of the prominent mountains that we saw were Mt. Trishul and Mt. Neelkanth. Finding a good camping site at this place is particularly difficult due to lot of lying uneven rocks underneath. early in the morning, since at that time the snow is still hard, you will need to be very careful while climbing these 2000 feets, there are fair chances of slipping down to thousands of feets down. 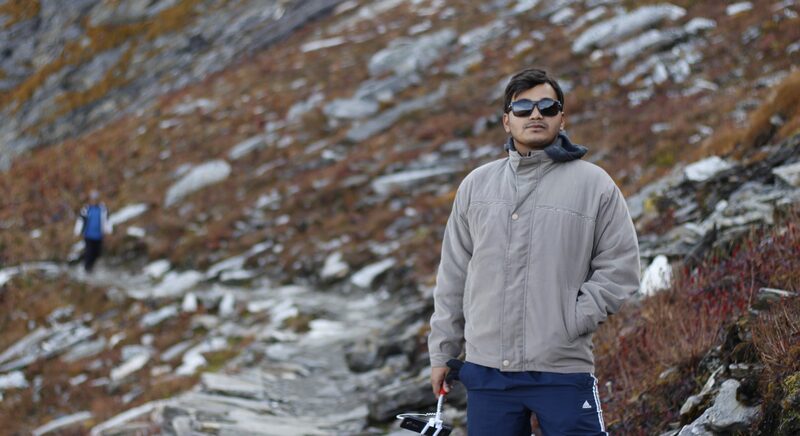 It is over-exhausting trek to Roopkund, the lack of oxygen is an add on,which will lead to breathlessness and dizzy feeling. There are loose stones and rocks to be seen all over. After all the hard work, yes we had made it! Encounter with the mysterious lake or the skeleton lake, that has been mysterious since its discovery, is enough to give you goosebumps, You see the mortal remains of those ancient people still near the edge of the kund, presence of humans in such inhospitable conditions is a big curiosity among the scientists, there are lot of skeletal bones that can clearly be seen on the edges of the lake ,of course removed by people from the lake, anthropologists suggest that 80 % of these remains belong to Persian people, however this is still a Mistry. According to the locals this was due to self invited wrath of the goddess, who was unhappy with the celebrations of singing and dancing on birth of the heir of Maharaja of Kanauj who was on pilgrimage to this site, as it was against the customs, and invited the wrath of the goddess, they were caught in a hailstorm which left no one alive and roopkund became grave for their uncovered mortal remains. The lake is quite big covered by all sides with tall mountains that surround it, it had become quite foggy on the day of our visit and moreover there wasn’t any water as the lake had gone dry. To our surprise as soon we started decending it started drizzling and soon turned into good rains,maybe roopkund needed to be filled up with the water it needed! Returning from trek although is relatively easier, it was made more harsh for us due to continuous rain that came up, it was muddy and slippery all over extra cautious one has to be while descending, since this can cause serious injuries or my lead to fall several thousand feets down, even the rocks had become very slippery, although few of our group guys slipped and rolled, but nobody was inflicted with any major injury. we did stay for a night at Bedni camp, and descended down to Wan village by 1’o clock in the day, stopping for a while in Gharoli patal and Neel Ganga,the sight of which will drain all your pain. Although this trek is a 8 day trek, we had done it within 4 days, since we were covering twice the distance, am glad to have done it well in time with other mates, everyone had that feeling of achievement, indeed it is a feeling of achievement that you have, when you experience something like this, you can be proud of yourself! Getting away in the nature, away from the cozy comfortable confines of your home will teach you a long way, the struggle for life, experiencing the true Nature, a bonding with mates, you will not care anymore for the dirt around, your mind will still be lost in those mountains days after your trek, this is wonderful, fills you up with sheer excitement , confidence in yourself, joy, achievement and feeling of being important to yourself. Life as it goes ashore!